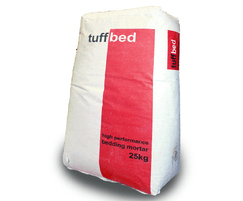 tuffbed is a high-performance, convenient bedding mortar for all types of bound paving. It is a pre-blended single-bagged product that offers convenience on site: one bag, just add water. Bedding depths of 20–70mm may be placed in a single layer, while greater thicknesses may be placed in successive layers. tuffbed meets or exceeds the performance requirements of BS 7533-7 and BS 7533-12. It has a high compressive strength and optimal elastic modulus capable of withstanding the stresses of heavy trafficking for a long lifetime and low maintenance. Paving works may be open to most forms of trafficking within 14 days, and very heavy trafficking within 28 days. 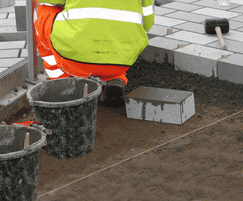 For paving requiring full trafficking within 3 hours, refer to tuffset G.
Where an enhanced adhesion bond is required for certain applications, refer to SteinTec tuffbond bonding/priming mortar. 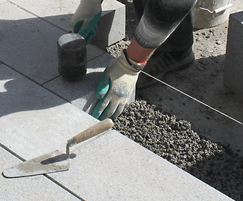 tufftop (previously called tuffgrout) is a high-performance jointing mortar for grouting all types of paving. 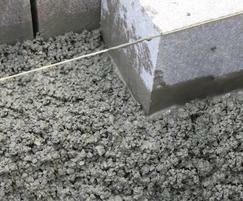 When mixed with water, tufftop forms a free-flowing slurry grout that is worked into the joints using a squeegee. Have a look at our latest footage at https://vimeo.com/170623213 and make up your own mind. The silos versus forced action mixers is an age-old debate but we think silos have had their day for professional paving projects.